First of all, sorry for my absence - my little sister got married this past weekend and I intended to have some posts scheduled but with the travelling, last minute wedding details and all the fun we had in Texas, it just didn't happen. But I'm back and I've got some great recipes to share with you coming up. I've been eyeing the fresh pineapple every time I walked through the produce department for a couple of weeks. Finally I decided to buy one. I have to admit, I have never bought a fresh pineapple before thinking it would be way too much work to cut up. If I bought it fresh, I would buy the already cored and cleaned pineapple for way too much money that comes in a little plastic cup. But that means I over paid by about 5 times. For something that is really very easy. So if you have this same trepidation about purchasing a whole fresh pineapple, check back tomorrow for a how-to post and learn just how simple it is. 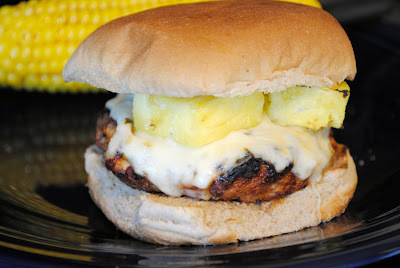 If you want to, you could also use canned pineapple to make these burgers, but fresh pineapple grilled better and make sure you buy the pineapple in its own juice not heavy syrup. For now, let's talk about these burgers. These were absolutely delicious. I had a chicken sandwich at a restaurant once (although I cannot remember what restaurant) that had pineapple, pepper jack cheese, BBQ sauce and chicken breast. I wasn't a big fan of the BBQ sauce, but I loved the combination of spicy cheese and sweet pineapple. I had some ground chicken breast at home and since I had finally decided to buy the fresh pineapple, I decided to make my own version. I think the pineapple is juicy enough and as long as you don't overcook your burger, the sauce is unnecessary but if you wanted to add something, a little chipotle mayo would be my recommendation. I would also throw a couple slices of red onion on these next time but I didn't have any on hand this time. As you can see in the pictures, I served these burgers with some chipotle corn on the cob that was a great match, so check back for that recipe later this week. Combine the ground chicken, soy sauce, 1/2 the paprika, 1/2 the chili powder, seasoning salt, cumin, and garlic. Lightly mix with your hands and divide into 6 even balls. Form patties, making them slightly thinner in the middle and sprinkle with remaining paprika and chili powder. Refrigerate about 30 minutes. Preheat the grill to medium heat. Coat grates lightly with oil. Grill burgers over medium heat about 6 minutes per side. The burgers should flip easily when they are ready to turn, if they want to stick, give them another minute. Top with cheese for the last 1-2 minutes of cooking time to melt. Remove to a plate and cover with aluminum foil to rest. Grill buns if desired. For the pineapple, if you are using rings, grill directly on the grates over medium heat. Carefully turn after 1-2 minutes. 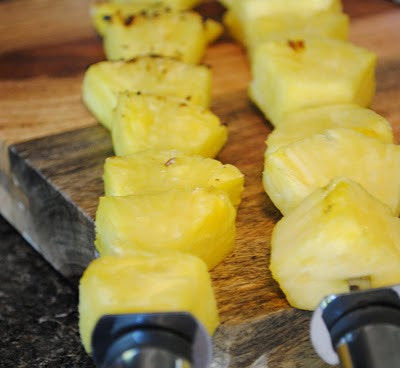 If you are using pineapple slices or chunks, thread onto skewers and grill skewers in the same fashion. Assemble burgers and enjoy. Oh, this looks so yummy. I am nervous about pineapple on my burger, but I might need to try this it just look juicy and refreshing. @Jennifurla - it seems odd at first but it's really a great combination. Do you like fruit in salads or other savory/sweet combinations? If you do, I'm guessing you'll like this one. These looks so fresh and summary! I'm really liking pineapple with savory things lately. :) I also have never bought a whole one - looking forward to your tutorial on how to cut one! Now this looks GOOD!! What a great idea for a burger!! Looks fantastic. That grilled pineapple looks so good on that burger. These look so good! 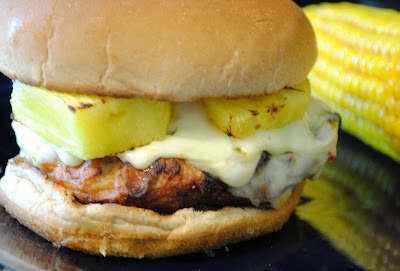 I love the idea of putting grilled pineapple on a burger. That is one tasty looking burger! I agree that it looks and sounds yummy! But ground chicken...? Where do I get ground chicken? @Bob - you have 3 options... get it from a butcher, buy a package in the supermarket - it will be at the meat counter with the rest of the chicken, or make you own by grinding some skinless, boneless chicken in a food processor. That looks absolutely wonderful! I've been looking for a recipe like this. Thanks! The best place to buy fresh pineapple is Aldi's. This sounds absolutely amazing, different and refreshing. A new twist to the burger.....and is sounds healthy and yummy! This is such an excellent recipe! I just featured these burgers on the VirtualWineBar.com as today's "Daily Nosh". I paired them with a bottle of Alta Maria 2009 Chardonnay. Wow! We made these tonight, and they were delicious!! Thanks for sharing this recipe! Everyone in my family loved these burgers. Thanks for sharing! I made these two nights in a row! I added a bit of shiracha to the bun. I used thin wheat buns. So good! I also added a light dusting of bread crumbs to the out side of the burger for easier handling. Ground chicken is very sticky. These look great and I'm making some right now but when does the garlic go in...? Am I just missing it? My apologies - good job noticing that one... it should be mixed into the patties with the other spices. I've updated the above instructions. These were really yummy! Sriacha on the bun is a MUST! I just mixed these up and there are really "soupy", no way I can make them into patties. I am assuming it's because I bought the pre-packaged tubes of ground chicken. :( I am so bummed b/c I was SO excited to make these tonight for dinner! Mine were a sloppy mess too! I took a baking sheet lined with foil and sprayed with PAM, then somehow formed blobs of chicken slop into circular forms....they're in the oven now, hoping they'll firm up a bit and then I can finish them off on the grill. I used Purdue ground chicken. Try adding in some bread crumbs (or mashed up saltine crackers!) This might not work if its too "soupy" but it does wonders when there is just a little too much juice! You can also make them ahead of time and pop the mix in the fridge till it firms up again and then form the pattys. Also, spray your hands with the cooking spray and it makes it much easier to release into the pan. This happens to me when I make turkey burgers too..
OMG, these burgers were delicious! I put sweet and sour sauce on them. My family loved them! These burgers have made it onto my dinner menu! I made these last night and they were fantastic! I had to put this recipe in my permanent book! I saw your recipe on pinterest and my mouth started watering! I have cooked with pineapple before and love it. I made a few changes due to what I had on hand and the season. I did turkey burgers seasoned with curry, cayenne pepper, and cumin. Topped them with canned ring pinapple I roasted, caramelized sweet onions, bacon, and pepper jack cheese. On an onion roll. The family loved them. 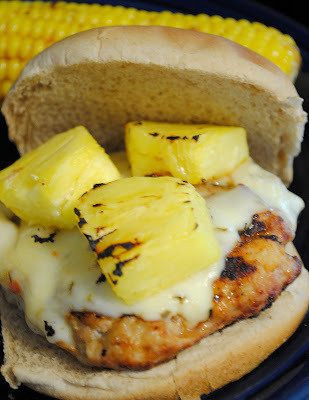 When spring has sprung I def want to make with fresh pineapple and grill it! Thanks for sharing!!! Made these yesterday, really enjoyed them! Quick and easy, also reheated well. Thank you! Next time you buy a fresh pineapple prop it upside down for a week! This allows the nature sugar that has settled during shipping to move back up through the pineapple. It will be the best pineapple you will ever eat! Can't wait to try your recipe! This will yield 6 good size burgers at about 1/3 lb each. You can stretch it further to do 8 if you wanted them to be a little smaller. I made these and they turned out great! I added some chipotle mayo on the burger for an extra kick and red onions ...with a side of garlic rosemary sweet potato fries..perfect meal..yummy! I just noticed someone else put a post about where do you get ground chicken. I have never seen or heard of it. I would like to try it with a chicken breast I think. Yummy. These burgers were delicious! I ate mine without a bun and didn't miss it at all. Is there any easy way to print this recipe that I am missing? I made these for dinner tonight...I normally don't care for chicken or turkey burgers, but these were SO GOOD! Thanks for a great recipe! I put pineapple on my burgers all the time. I have them growing in my yard. I live in Hawaii. Chipotle corn on the cobb recipe please? These are absolutely INCREDIBLE! I've made them several times using turkey instead of chicken (because I already had it). Also, I've made them in smaller "slider" size & used Hawaiian Rolls. TOTAL YUM! They are always a hit! Thanks! We made these using ground turkey and they were delicious! I am trying these tonight, except instead of using ground chicken, I am using chicken breast and using the sauce and seasonings as a marinade. I hope it turns out. It sounds delicious! These were delicious and super quick to make. My kids asked for seconds... that never happens! Made mine on the stove top. I was nervous this would either be a huge it or an epic fail. It was a hit. Delicious. Will make again. Made these a few weeks back. They were sucha huge hit making them again tonight!